Congratulations to Amy W. for winning our Big Customizable Giveaway! If you didn’t win then stay tuned — we’re announcing another big sale on customizables soon! We’ve added a few new homespun projects to our website. You can view simple instructions for making a rag-style wreath and a rag-style potholder. We also have very detailed instructions for making a Ragged Journal Cover. You can use our instructions and homespun fabrics to make a cover for your journal, planner, favorite book, or, if you’re like me, your book of to-do lists! We had to make several of these journal covers to get all the pictures for our projects page so we’d like to share one with you! One winner will receive a Ragged Journal Cover with the journal included! Leave a comment on this post by Sunday, September 16th to enter the Ragged Journal giveaway. A winner will be randomly selected and notified via email on Monday, September 17th. This journal cover would be great for our women’s retreat. woo hoo this is sooo cute! I love this journal. 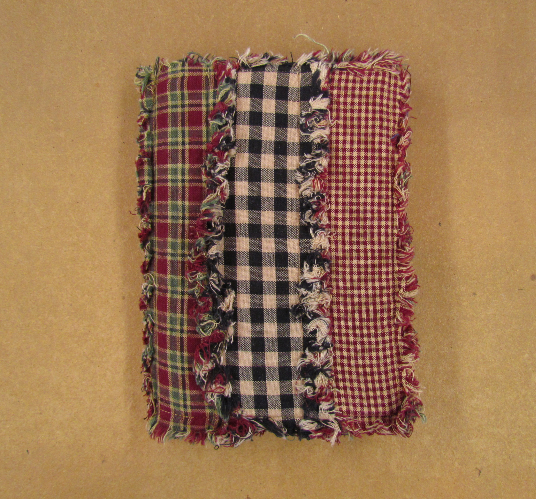 I have been making rag quitls for several years and I was looking at ideas of ways to use left over squares and this is a great idea. Thanks! This is soooo clever!! LOVE it! Well…have to be honest…LOVE anything made this Raggedy way! Lol But this is really waaaaay cool! Thanks for chance to win one! I love all your fabric and projects on your website. I am placing an order today. I appreciate the opportunity to enter the giveway for this cute journal cover! Love the ragged journal cover!